The Architecture training materials bundle includes all of the materials needed to improve your existing skills in the industry standardsoftware related to AutoCAD Architecture. 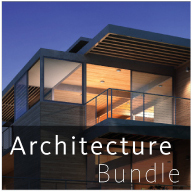 The bundle includes courseware for AutoCAD Architecture, AutoCAD MEP, Navisworks and Raster Design. The Architecture training materials bundle includes all of the materials needed to improve your existing skills in the industry standardsoftware related to AutoCAD Architecture. The bundle includes courseware for AutoCAD Architecture 2017, AutoCAD MEP 2017, Navisworks 2017 and Raster Design 2017. Includes a 137-page online manual, 22 exercises and 9 instructional videos. This online training manual was designed for all architects and building design professionals. At its most fundamental level, AutoCAD Architecture allows two separate approaches to project design; Conceptual Design (using simple architectural shapes to form an exterior model of your building project), and Design Development (jumping right into the project with walls, doors and windows). These approaches can be used together as complementary design methods, or they can be used separately. This course will focus on Design Development features. Recommended prerequisites: AutoCAD Level I and II. All primary features of Design Development through Construction Documentation. ADT's ObjectARX entities allow for quick placement and modification of standard building elements. Users will assemble a building model complete with walls, floor, doors, windows, openings, stairs, railings, roofs, and column and ceiling grids. Topics will progress towards Construction Documentation features, including annotation, tags, scheduling, and symbol management. Students will learn to quickly generate floor plans, sections, elevations, and perspectives of the 3D building. Includes an 80-page online manual and 17 instructional videos. This online training manual is recommended for all building design professionals. MEP is the AutoCAD software-based building design and construction application for mechanical, electrical, and plumbing (MEP) professionals. Designers and drafters can use this software to improve productivity, accuracy, and coordination. Recommended Prerequisite: AutoCAD Level I and II. All primary features of Design Development through Construction Documentation. Autodesk MEP's ObjectARX entities allow for quick placement and modification of 3 dimensional building elements such as ducting, piping, and electrical entities. Users will assemble a mechanical plan, complete with heating/cooling ducts, plumbing fixtures/piping, and the electrical system layout. Topics will progress towards Construction Documentation features, including annotation, tags, scheduling, and symbol management. Includes a 57-page online manual and four instructional videos. Autodesk Navisworks software for Building Information Modeling (BIM) can help architecture, engineering, and construction professionals improve control over project outcomes by enabling 3D models and multiformat data to be integrated and shared for review between all project stakeholders. This online training manual will introduce the key components of the program. It covers the Navisworks interface, working with Navisworks file types, navigation tools, sectioning, selecting tools, modifying objects, measuring objects, the TimeLiner and Clash Detective. The TimeLiner comes with both Simulate and Manage, while the Clash Detective is only a part of Manage. Recommended prerequisites: None. Introduction to Navisworks Freedom, Simulate & Manage, Interface, Important Options, File Types (NWD, NWC & NWF) and Managing Files, Navigation Tools, Sectioning, Selecting Objects, Modifying Objects, Measurement, Redlines and Comments, TimeLiner, Clash Detective (Manage). This manual will not cover the Scripter, Animator or Presenter. Includes a 29-page online manual and four instructional videos. This training manual focuses on the tools for overlaying, editing, and plotting raster images in combination with vector information from AutoCAD. Raster Design provides raster display, image enhancement, and plotting capabilities for satellite imagery, scanned aerial photographs, or color TIFF images within AutoCAD. Overlay photographic images behind maps, plan and profile sheets, and other construction documents for site feasibility studies, GIS, presentation drawings, and more. Raster Design also allows editing of raster images. “Heads-up” digitizing improves speed and accuracy. Scanned drawings may be converted completely to AutoCAD files or partially revised and plotted as hybrid raster/vector drawings. Learn editing tools to locate, draw, erase, and change raster as easily as vector. Recommended prerequisites: AutoCAD Level I and II. Learn editing tools to locate, erase, and change raster as easily as vector. Rubbersheeting tools facilitate more exact georeferencing. Overlay photographic images behind maps, plan and profile sheets, and other construction documents for site feasibility studies, presentation drawings, GIS, and more. Use the Palette Manager to change the colors of the image like layers in an AutoCAD drawing. "Heads-up" digitizing improves speed and accuracy. Line following routines can be used for automated conversion of contour data. Text recognition routines convert raster text to AutoCAD text objects. Scanned drawings may be converted completely to AutoCAD vectors or partially revised and plotted as hybrid raster/vector drawings.